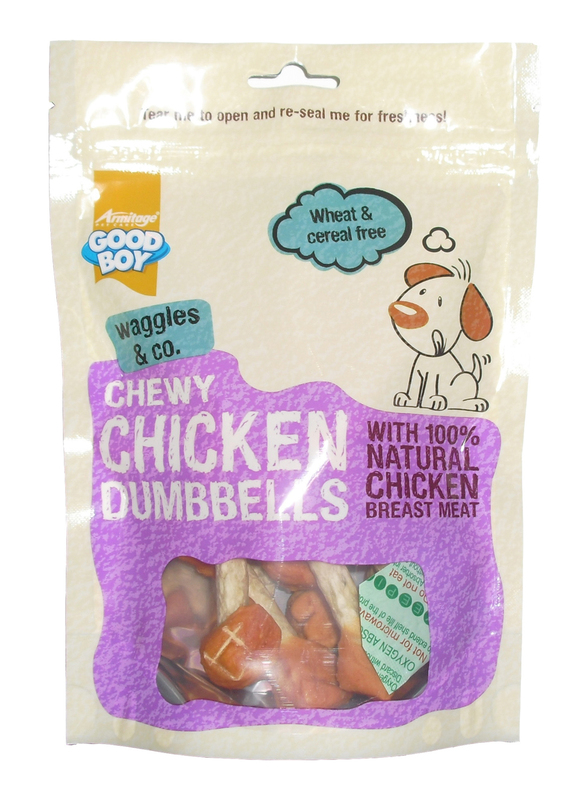 Waggles & Co Chicken Dog Treats from Good Boy are an oven roasted snack made from real meat which give your dog an enhanced flavour that he won't want to leave alone. These premium quality treats are suitable for all breeds of dog and come with no artificial colours, flavours or sugars. A healthy treat or training reward for your favourite pooch. Meat & Animal Derivatives (min. 75% Chicken), Derivatives of Vegetable Origin and Salt. Meat and animal derivatives (75% chicken), cereals (15% rice), eggs and egg derivatives and minerals. Meat and animal derivatives (55% chicken), derivatives of vegetable origin, cereals, eggs & egg derivatives, minerals (2% calcium) and oils & fats. Feed as a treat, reward or training aid. Always ensure there is a bowl of clean, fresh water available. It is recommended that pets are supervised when feeding. Treats should be given on non-stainable surfaces. Not suitable for puppies under 4 months old. Below are some recent questions we've received regarding Good Boy Waggles & Co Chicken Dog Treats, including answers from our team. Is this product suitable for puppies under 3 months? Thank you for your question, unfortunately this product is not suitable for puppies under 4 months of age.